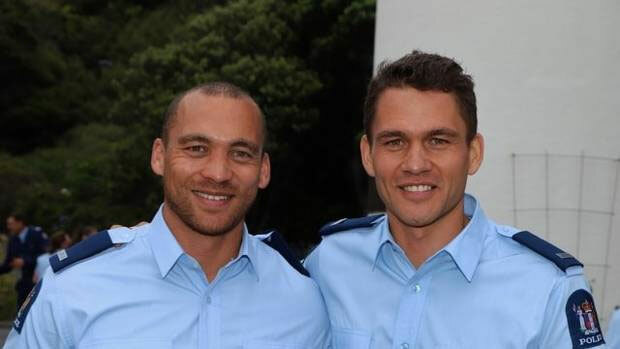 WHS old boys' Joshua and Riki Kauika are award winning graduates from the Royal New Zealand Police College. Whanganui woman Anne Kauika can be very proud of her two sons Riki and Josh. Riki Kauika is a former national golfing representative and the other has spend 12 years in the navy. Now their careers have stumbled on to the same pathway; they both just graduated from police college in Wellington last week. And they both took out awards as they did so. "Very [proud], yeah definitely," said Anne Kauika. "They're great boys and it was very cool to go down to their graduation on Thursday and they are very happy young men actually. "It's really cool to see them really excited about going into the police force, it's awesome." Constable Riki Kauika was given the Driver Training and Road Policing Practice Award, while Constable Joshua Kauika took the prize for Physical Training and Defensive Tactics. The Kauika brothers also have an aunt who was in the police for a few years, based in Taumarunui. "I think they'll make really good policemen actually," Anne said. Anne Kauika said Riki probably preferred to be on the beat and he'd want to get a good feel for the job. "He's probably a quieter man than what Josh is - but in saying that he will be a very good community policeman. Plus he's got a very technical head on his shoulders from all the golf he's played. "I have no doubt he'll probably end up playing golf for the police as well." She said Josh's years in the navy meant he would be able to be called upon by the police dive squad if needed. He has already worked with the police in search and rescue operations. But, like Riki, it was likely Josh would first do a few years on the beat. Josh will start his work in Northland while Riki will be deployed to the Central District. The Kauika brothers graduated alongside 77 other new constables at The Royal New Zealand Police College on Thursday. The new constables are aged between 18 and 50 and began their studies in September.